On World AIDS Day the World Health Organization (WHO) emphasizes that expanding antiretroviral therapy to all people living with HIV is key to ending the AIDS epidemic within a generation. “The Millennium Development Goal of reversing the HIV epidemic was reached ahead of the 2015 deadline — an incredible achievement that testifies to the power of national action and international solidarity,” declared WHO Director General Margaret Chan. 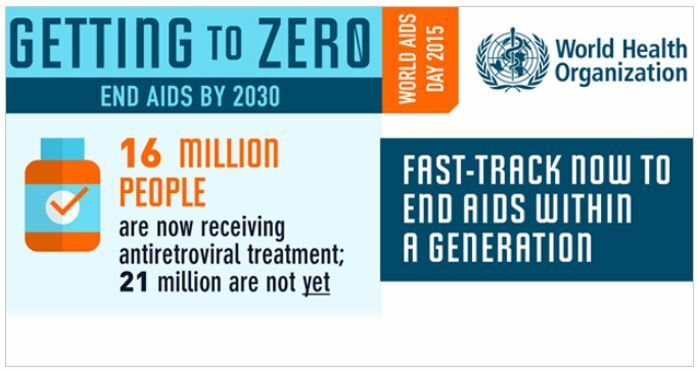 Expansion of antiretroviral therapy (ART) has resulted in a stark reduction of AIDS-related deaths. At the same time, increasingly effective prevention efforts have reduced numbers of new HIV infections. Since the epidemic’s peak in 2004, the number of deaths has fallen by 42 percent with some 7.8 million lives being saved over the last 15 years, according to a new WHO report. The number of new infections has fallen by 35 percent since the turn of the century. Over the last 15 years, scale-up of ART has been most dramatic in the Africa Region where now more than 11 million people are receiving HIV treatment, up from 11,000 at the turn of the century. People living with HIV in Africa are now more likely to receive treatment than people living in most other parts of the world. Globally, in June 2015 close to 16 million people out of a total of 37 million people living with HIV were taking ART. At the UN General Assembly in September, world leaders endorsed a new set of Sustainable Development Goals and milestones, including a call for ending the AIDS epidemic by 2030. Reducing the number of new infections by 75 percent and doubling the number of people on ART by 2020 are the first milestones towards achieving this goal. Trial results published earlier this year have confirmed that people living with HIV who begin antiretroviral therapy soon after acquiring the virus — before the virus has weakened their immune systems — are more likely to stay healthy and less likely to transmit the virus to their partners. Those findings led WHO in September to recommend that everyone living with HIV be offered treatment. In the effort to help countries implement the “treat all” recommendation, WHO is now presenting an additional set of recommendations on how to expand ART to all in a rapid, focused, and efficient manner. These recommendations include using innovative testing approaches such as community or self-testing to help increase the number of people who know their HIV status; starting treatment faster in those people who are diagnosed with HIV; bringing ART to the community; and allowing for greater intervals between clinic visits for people who have been stable on ART for some time. They also highlight the importance of improving access to viral load testing and new classes of antiretroviral drugs. “WHO applauds governments, civil society, and organizations that have made availability of life-saving antiretroviral therapy possible in the most trying circumstances. The new recommendation to expand ART to all people living with HIV is a call to further step up the pace,” said Dr. Winnie Mpanju-Shumbusho, Assistant Director General at WHO. Already, over the last five years in Africa some 10 million men have undergone voluntary medical circumcision, a procedure that reduces their risk of acquiring HIV by 60 percent. New approaches to prevention are also emerging, including the use of antiretroviral drugs to help people at substantial risk from acquiring HIV. WHO now recommends this practice, called “pre-exposure prophylaxis,” or PrEP, as an additional option to augment comprehensive prevention for people at heightened risk of HIV infection. Other elements of this package include behavior-change communication, the consistent use of male and female condoms and prevention programs for key populations, including harm reduction for people who use drugs. The same drugs that keep people living with HIV from becoming sick also prevent transmission of the virus from pregnant women to their infants. Among the 22 countries that account for 90 percent of new HIV infections, eightt have reduced new infections among children by more than 50 percent since 2009, based on 2013 data, and another four are close to that mark. Some low- and middle-income countries have made remarkable progress towards universal access to HIV services: 12 countries have ensured that 60 percent or more of all people living with HIV are aware of their infection and receiving antiretroviral therapy. Key ingredients of the successful HIV response in these countries are national ownership, greater focus of HIV services to reach the most affected locations and populations based on good data, and simplification of prevention and treatment services.